This past week I spent some time at the Cultural Heritage Survey Office in the city's Planning Department preparing for today's Oakland Heritage Alliance walking tour. The tour, called "Lake Merritt's West Side Story," starts at 11 a.m. in front of the historic Municipal Boathouse, now home to the Lake Chalet Seafood Bar & Grill, at 1520 Lakeside Drive. I have learned that whenever I look through the survey files, I should expect to find out more fascinating things about Oakland; this time was no exception. Little Snow Park, next to Harrison Street and facing Lakeside Drive, has an interesting story to tell. 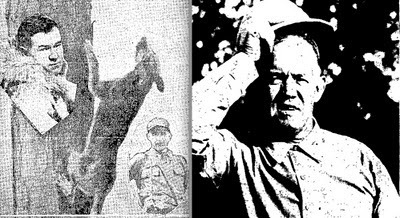 According to the files, Henry Snow was a hunter of African big-game animals in the early 1920s. He wished to donate his collection of animals to the city, provided that a suitable museum could be built to show off the collection. The mayor at the time, John Davie, was eager to accept the donation, thinking a natural-history museum would complement other cultural institutions, such as the city's Fine Arts Gallery and the newly opened Public Museum, which was located nearby in a Victorian-style mansion that overlooked Lake Merritt and was converted from what had been a private residence. Davie's predecessor, William Mott, Oakland's mayor from 1905-15, was responsible for opening the Public Museum. Museums, galleries and other civic improvements were part of the so-called Progressive Era agenda prevalent in many communities like Oakland in the early 20th century, the files state. Oakland voters approved bond measures during that time to pay for the improvements, which included building a new city hall, an auditorium/arena and boulevards around the lake. A state-of-the-art water pumping station — today's Lake Chalet restaurant — to be used in firefighting emergencies also was constructed. Mott's administration purchased the lakeside mansion and other grand homes such as the deFremery estate in West Oakland — subsequently converted into a public park — and the Mosswood estate on Broadway — it too became a park. When Snow was ready to turn over his collection, the city had another vacant residence to offer him. It was to be a temporary location, files say, until a proper facility could be built. The home in question belonged to the late Francis Cutting, who had made his fortune in the canning industry during the late 19th century. An East Coast native, Cutting came to California during the Gold Rush, and brought with him knowledge about new technology that preserved and packaged foods so they could be stored at room temperature without losing nutrient value or flavor. This proved to be a big advance in the processing of fruits and vegetables. Oakland, with its strategic location close to rail, road and water, was a convenient place to establish canning companies. Cutting's company eventually would grow and merge with others; today's Del Monte Corporation is the modern conglomerate with roots back to that era. After Cutting's death in 1913, his heirs inherited his estate and later sold it to the city. File photos of the Cutting home, erected in 1903 and facing Alice and 19th streets, show it resembled a rustic hunting lodge. The plot maps show back garden acreage running to the lake's shoreline; a separate boat house stands nearby. At the time Cutting lived in his home, Lakeside Drive did not yet exist along that side of Lake Merritt. He, like other well-to-do lakefront dwellers of that era, enjoyed special access to the water. In 1922, Snow, with the help of his son and daughter, moved in, transforming the place into "a taxidermic menagerie of elephants, bears, leopards, lions, snakes and birds," according to an article in a survey newsletter. A small enclosure was created next to the building to house live animals. Unfortunately, Davie could not keep his promise to the Snow family to build a proper institution. Snow died in 1927. Son Sydney and daughter Nadine kept his legacy alive, relocating and expanding the zoo to the hills and keeping the specimens in the house available for countless school field trip visitors well into the 1950s, files tell us. The old home was torn down in the 1960s, and for a time it appeared that a large convention-type hotel would be built there. Open space advocates protested, and it has, thankfully, remained a park. As I continued my review of the files on Snow Park, I did come across something I was unaware of. Very early maps show the area now listed as the park was one of Oakland's early cemeteries. I checked my copy of Beth Bagwell's "Oakland: The Story of a City," and sure enough, as the town grew in the 1850s, the need to find a more remote location for the dead became ever more pressing. Today's Mountain View Cemetery, which opened in 1864, became the solution. It does seem, file notes speculate, that because of all the early rush to build, some graves may not have been properly emptied. That did give me pause. Find out more about Lake Merritt's fascinating history. Details about today's tour are at www.oaklandheritage.org. Copies of Bagwell's history of Oakland are available at the Oakland History Room in the Main Library, and I recommend it to all who want to learn about our history. Many photo books on early Oakland have been published but not one has ever included a photo of the Snow Museum. The museum was housed in an utterly amazing Victorian mansion that was circular in shape. As school children we were often taken there on field trips.. A photo would be WELL worth seeking out. My grandparents knew the Snows. My grandmother knew Sydney Snow & when I was growing up in the 1940s we often visited him at, what was then called, The Durant Zoo. He cared for the animals. He'd take us on tours and let us watch him feed the animals. Once he took his shirt off and showed us the scars he'd received after being mauled by a bear. I was chased by a peacock. I must have been around 6 at the time. Anyhow it's great fun to remember.